You've got an image editor, and your files all synced in a structure you like. You just want some software to categorise them. Enter Aranea. This is not the final list of features. We've got a lot of awesome stuff planned for Aranea and this page will be updated with the current feature list as we release! Aranea doesn't mess with your directories or move your files around. Simply tell it where your files are! Aranea features a powerful tagging system to allow you to organise your library quickly and effectively. Organise your tags into People, Places, Things, Animals, Events and Activities to keep your library in control! Support for enormous image sets is out of the box, 10 or 10,000,000 images, Aranea can handle it. Group your images into Sets - related images that shouldn't be split up. 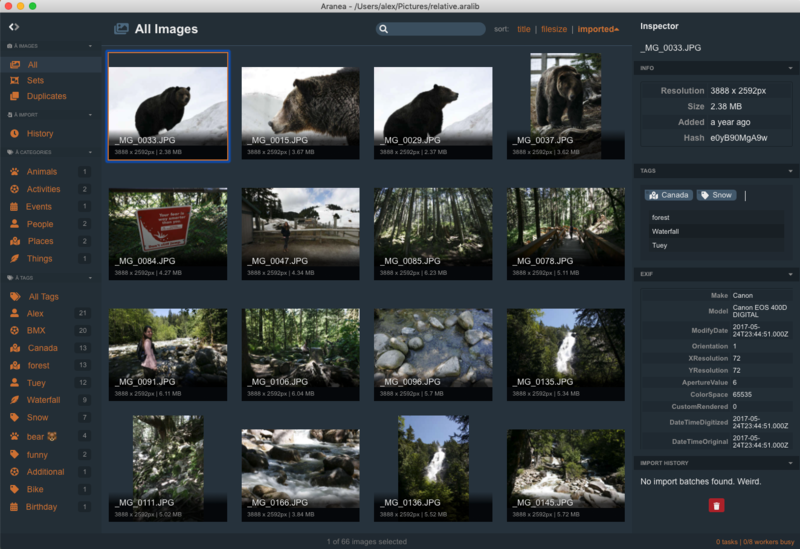 Quickly find and resolve duplicate images within your library. We've got a load more features planned, right now Aranea is in the very early stages of development, so keep checking back here for more info! Will be unstable and missing core functionality. Provided on purely early access terms. We may ask you to rebuild your library during the Alpha phase, so this is for experimentation only. Stable, but likely to still have some bugs. Most, if not all functionality should be present. We will do everything possible to ensure libraries built under Beta releases won't need to be rebuilt on subsequent Beta or Stable releases. Stable and as bug-free as humanly possible. This will be the commercial version of Aranea, price TBC. A huge release with a load of new features and some hefty performance boosts! Bump to Electron 2 for more performance and features. Did we mention some huge performance fixes? This one took a bit longer than planned, mostly cos I moved halfway across the world in the middle of development! This release focuses on building on tags with categories, being able to group images together into Sets, and lots of navigation improvements! Enjoy! An absolute monster of a release, focusing mainly on library support, extending tagging and addressing a tonne of performance issues! This release adds some core functionality; tagging! Add tags using the Inspector and view them and the images attached to them in the sidebar. This release focused on getting the core application up and running with importing into the library being the killer feature.